What would you give for a brain chip that seamlessly translates any language into your native tongue? Or a retinal implant that lets you see in the dark? Or an implant that lets you record every single memory and experience in your life and replay it at any moment? This is all science fiction, but it may not stay that way for much longer. While we aren’t quite at the point of perfect memory recall, scientists have been working to merge man and machine. Theodore Berger, a biomedical engineer and neuroscientist at the University of Southern California, and colleagues have designed a device that is implanted into the brain and mimics the function of the hippocampus, a part of the brain involved in memory and one of the first regions in the brain to suffer damage from Alzheimer’s Disease (Figure 1). Figure 1: (top) Cross section of the human brain. The hippocampus, highlighted in purple, is a major part of the brain that is involved in the formation of memory, spatial memory, and navigation. Implanted microelectrode arrays can induce a specific set of electrical signals that match the existing firing patterns in the hippocampus, possibly allowing for memory enhancement. (bottom) Neurons communicate with each other in the form of action potentials or “spikes.” Spikes are discrete events whose rate and timing carry information. By collecting data about the firing patterns of cells in the hippocampus during a memory task, Berger was able to precisely stimulate the hippocampus in a way that allowed them to “replay” the memory. The effectiveness of this device has been tested in multiple animal models, from rats to non-human primates. Now, Berger is testing an implant for human use. These memory implants fall under the umbrella term of brain-computer interfaces (BCIs), and Berger is not the only one to use this approach in hopes of changing the way humans interact with their environment. Scores of Silicon Valley startups and tech giants, such as the billionaire CEO of Tesla and SpaceX Elon Musk, are throwing their weight and money behind efforts to push the boundaries of such technologies. 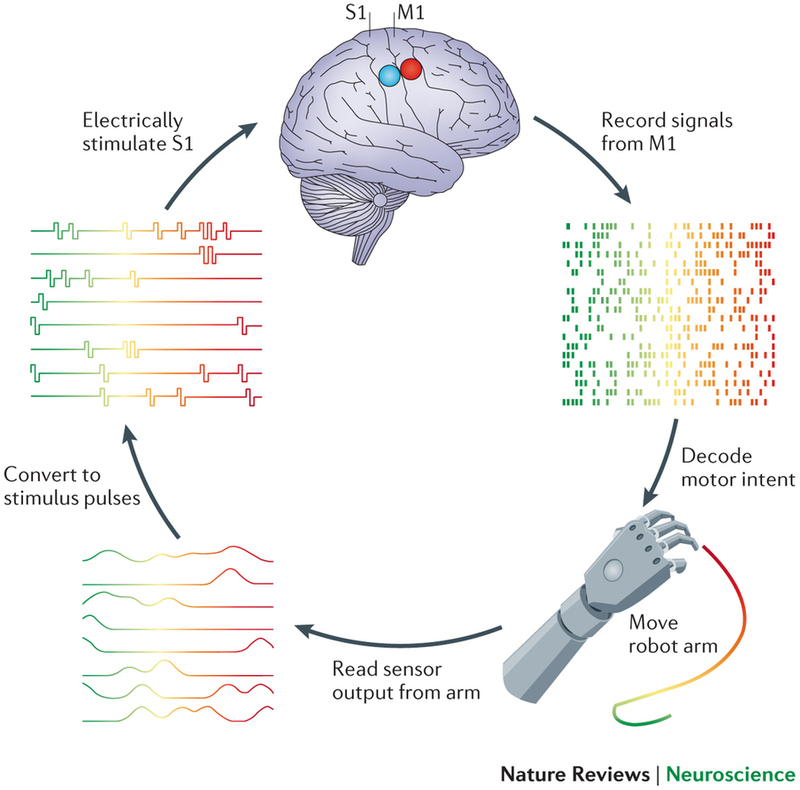 Brain-computer interfaces are technologies that provide a direct link between a brain and an external device, and they are often aimed at repairing or augmenting processes involved in cognition, receiving sensory information, or producing movement. Typically, these devices work by recording and transmitting signals through electrodes implanted directly into the brain (Figure 2). Electrodes are small pieces of material that read and record electrical signals, in this case the brain’s pulses of electrical potential from neurons firing. In the brain, networks of interconnected neurons communicate through these pulses to carry out tasks, such as storing a memory. Often, devices called “neural prostheses” are used to supplement or replace neural circuits in the brain that no longer function properly. For example, early BCI experiments have allowed paralyzed and mobility impaired patients to move robotic limbs with their thoughts. First, the implanted electrodes record brain waves at the moment a person intends to make a movement. Then, the BCI learns the relevant electrical signal pattern and transmits that same pattern to a prosthetic limb. After a period of adjustment, the brain adapts in such a way that allows these signals to eventually be integrated into the natural flow of information transfer, allowing patients to control the prosthetic like a natural limb. However, the communication between the brain and prosthetic limb is much slower than in natural limbs, especially for complex movements. BCIs focusing on motor neuroprosthetics are only one example of the possible functions of BCIs. While many different types of BCIs exist today, they all address two questions: first, output, or “how do we extract what neurons are saying?”, and second, input, or “how do we send the right information to the brain?” (Figure 3). These two processes are always happening in your brain. Right now, your brain is outputting information to your eyes, directing them to move in order to read this sentence. At the same time, light is entering your eyes and stimulating neurons in such a way that allows you to see the image. While this may seem simple, in practice, it requires a complicated, coordinated network of neurons to carry out all of these processes. 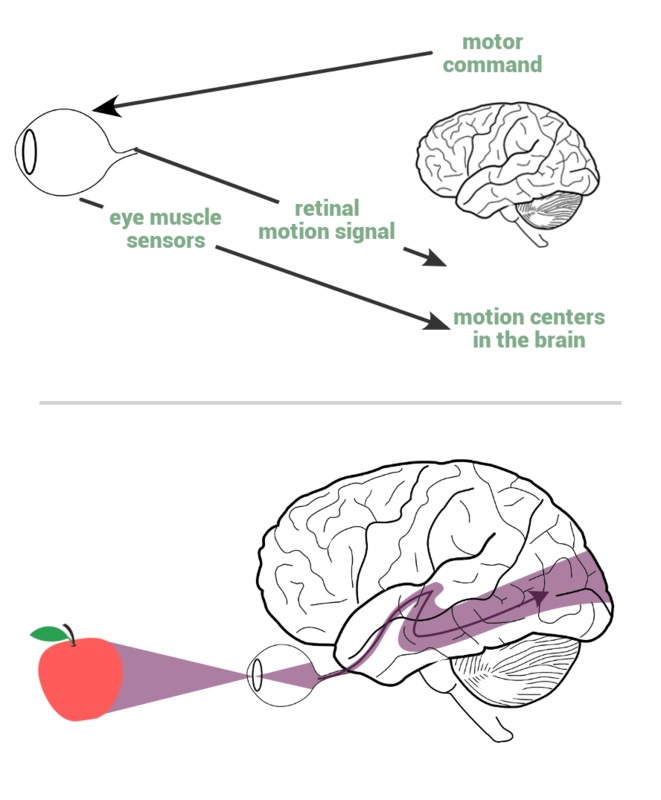 Figure 3: (top) Neurons in the brain are outputting information to your eyes, which receive and respond to the command to move. Information about the movement of our eyes is sent back to motor-related areas of the brain, providing a feedback loop that lets the brain update its output commands. 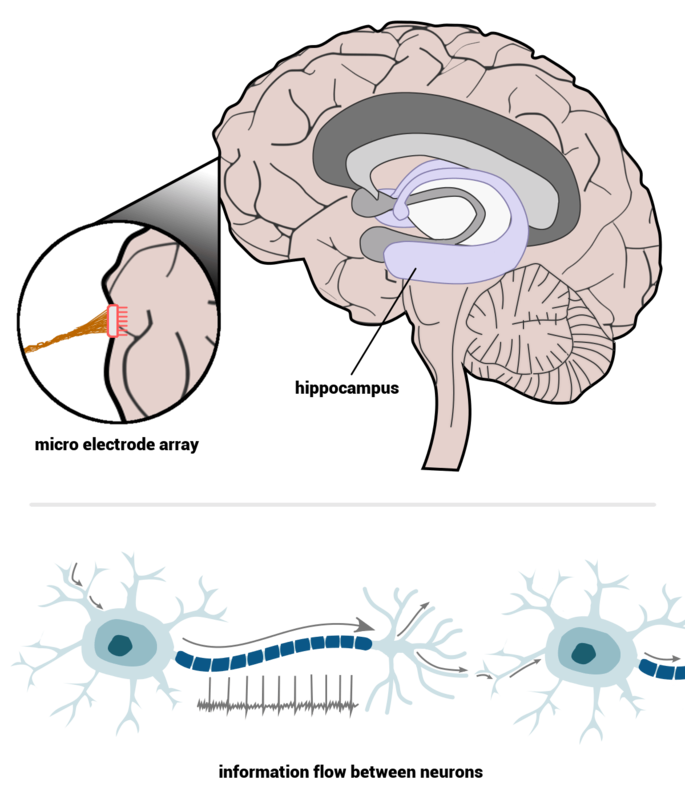 (bottom) Neurons also receive input from external sources. Light from this screen is entering your retinas and activating neurons in the occipital lobe, which is the visual processing center of your brain. This area is important for correctly understanding what the eyes are seeing. In recent years, BCIs have gained a huge surge in interest with major technology entrepreneurs throwing their hats into the arena, like Musk who newly formed Neuralink,. These tech titans are throwing money behind high-risk, high-reward ventures with the major long-term goal of using BCIs for human enhancement. In particular, Musk believes that fusing human and machine intelligence is necessary to counter the risk of runaway artificial intelligence that may, one day, surpass humanity. This controversial idea is meant to push human cognitive performance to level that is comparable to that of AI. While Neuralink is focusing on medical advancement as a first step, the company’s lofty ultimate goal is to enable users to be biologically connected to the internet, supporting communication without speech or writing – a kind of telepathy, if you will. However, Neuralink’s plans are still more conceptual than practical. As for Berger, he and his team are now testing memory implant prototypes in 12 human patients with epilepsy who already have electrodes implanted in their brains to help control their seizures. Because repeated seizures destroy parts of the hippocampus involved in memory formation, the implants, if successful, could help these patients as well. While initial findings are reportedly promising, it’s still too early to tell if their experiments will be successful. For many, augmenting humans through BCIs is not a matter of if but of when. So how close are we to actually successfully combining man and machine in order to build a better human? Can we believe Musk’s estimate that in eight to 10 years healthy people will be getting computer interfaces implanted? While it’s not completely crazy to imagine connecting human consciousness to computers, the timelines presented by these companies are overly optimistic at best. There are numerous obstacles to practical implementation that make it unlikely that we will see implants in healthy humans any time soon. First, we still lack a deep understanding of how the billions of neurons in the brain work together to provide perception, sensation, and thought. It will take years of dedicated research before we reach that point. To get there, we also need to develop better tools to both listen to and send information back to the brain. The technology we have now, such as functional MRI brain imaging, are more like blunt tools than the precise instruments we need. Second, it took decades of animal experimentation before the first neuroprosthetics was even implanted in humans in the mid-1990s, and it took more than 15 years for an implant to treat epileptic seizures to be approved for human use. It will likely take just as long, if not longer, for any augmentative devices to be approved. Even now, few people in the world have multi-electrode arrays implanted in their skulls. Those that do have undergone invasive surgery only as a last resort to alleviate symptoms of severe neurological disorders or to regain motor control in the case of paralyzed patients or amputees. Neuroprostheses for treating disease already face a number of challenges, so what about approval for implants for healthy people? That would require exceptional proof of safety. Anything implanted into the human body must meet all the standards of a medical device. Not only does the device require approval for a surgery to put it in, it carries a chronic risk to the brain to have a foreign object embedded in it. There has only been one known instance of a healthy person receiving a brain implant. In 2014, a neurologist and one of the pioneers of BCI, Phil Kennedy, paid a surgeon in Central America to install an electrode into his motor cortex and caused life-threatening complications in the process. When a device is approved for implantation in healthy volunteers, researchers will still have to work within the bounds of what is considered ethical for medical trials. Finally, permanent damage to the brain is a risk with implants. Brain tissue is soft, while most electrically conductive materials (think metals and wires) are rigid and inflexible, meaning that implants can cause scarring and immune responses. Over time, this will make implants lose their effectiveness. Given that it’s difficult and undesirable to replace these devices once implanted, this is serious problem to consider. However, the development of more flexible fibers and other materials suitable for implantation is a step in the right direction. The future may be a long way off for augmentative BCIs, but the future is also bright. These bold visions help push the boundaries of research and industry and set long-term goals. Moreover, in an age where funding for scientific research is becoming scarcer, it’s encouraging to have major tech companies investing serious efforts into risky neuroscience research. Julia Nguyen is a PhD student in the Program in Neuroscience at Harvard University. This article is part of a Special Edition on Artificial Intelligence. I wish Mr. Musk could make good on his timelines, even if the more level-headed author doesn’t think that possible. Thank you for this clear and lovely piece! This is a technology that will help us transcend our limitations as Terry Bison described in his classic novel “They are made out of meat”. While impressive computational machine it still has its limitations in terms of bandwidth and connectivity to the world wide web. How we will get there seems to be of big debate as there are many barriers like the biocompatibility of implants. It seems clear that non-invasive technologies will eventually prevail. We live in the most exciting era of humanity and I cannot wait to see what the next couple of decades will bring to us. Here to all the innovators out there!